I burned some cauliflower the other day. Maybe I should say I seared it so it sounds more intentional. I was scraping the little crispies off of the bottom of the pan and eating them because, you know, waste not want not. As it turns out, even burning– I mean searing— cauliflower can’t take away from its deliciousness. I figured there had to be a way to get that crispy cauliflower flavor without setting off fire alarms. So I tooled around the internet looking for recipes. There are lots of cauliflower ‘bread’ recipes out there. Crispy and delicious looking recipes. 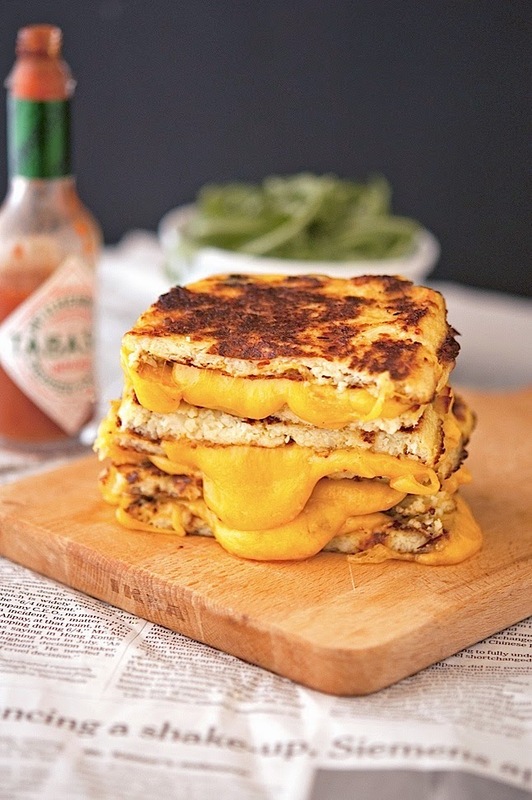 And then I stumbled upon a grilled cheese recipe. You guys! Grilled cheese! You absolutely have to try this. Preheat oven to 450°F and place a rack in the middle. Line a baking sheet with parchment paper and liberally grease it with olive oil. Set aside. Place the cauliflower rice in a tea towel and twist it to squeeze as much moisture as you can. This is very important. The cauliflower rice needs to be dry, otherwise you’ll end up with mushy dough, impossible to use as slices of bread. Transfer the cauliflower rice to a mixing bowl, add egg, mozzarella, salt, pepper and mix well. Spread cauliflower mixture onto the lined baking sheet and shape into 4 squares. Place in the oven and bake for about 16 minutes until golden. Butter one side of each slice of cauliflower crust bread (preferably the top part). Place one slice of bread in the pan, buttered side down, sprinkle with the cheese and top with the remaining slice of cauliflower crust bread, buttered side up. Hahaha! That’s the story of my life!